The story flows, the actors, for this genre, are absolutely remarkable, and when the movie ends one wonders why it was so short. A movie in which the Blu-ray cover states, "Money, Corruption and the American Dream" seems like it would be a movie about police force corruption, drug dealers, or strippers. No one in their right mind would think that Warner Bros. War Dogs is actually a movie about two of our military soldiers, Miami twenty-something's who were awarded a $600 million contract to arm the USA's allies in the Afghan war and their journey throughout. Not surprisingly, the first major scene shows David Packouz (Miles Teller; Divergent Franchise) in 2008 being held at gunpoint because, of course, he's an arms dealer. Teller's expression in the first scene of sheer horror at being caught is almost trademark as his character in Divergent also never seems to bear responsibility for his actions. Teller is a great actor- not quite so charming as others- but his sarcasm and expressions gives him a real quality to his acting and comes across in Packouz's character throughout the movie. As Teller advises us in the voice over, war is about economy. Then, the actual movie begins. March 2005 is the beginning of what you may have already guessed is the end for Packouz. The voice overs continue so that the writers give the viewers an image of where Packouz has been and where he is going to end up. Finally, Packouz reunites with an old friend, Efraim Diveroli (Jonah Hill; Knocked Up), who introduces him into the world of small military contracts that the big contractors ignore. Placed in a desperate financial situation, Packouz teams up with Diveroli and becomes, as they say, "pro-money" not "pro-war" as War Dealers. When it comes to Jonah Hill, you may think that this must be a comedy with bad language. Admittedly, his character does start off a bit like his stereotyped character role but soon into the film, it is apparent that Hill's character is nothing like what he's done before. Playing Diveroli, he makes himself into whomever someone wants him to be - the genius of his character - according to Packouz' voice over. Director Tom Phillips has created a masterpiece. Hill gives a decisive and impactful performance, commanding in personality. Teller also acts out of his comfort zone and gives a brilliant performance. His innocence throughout the film is refreshing and real. Phillips showed his talent by tapping into the incredible acting skills of Hill and Teller. Stephen Chin, Tom Phillips, and Jason Smilovic are remarkable screenplay writers. The dialogue and storyline was succinct and clear. There weren't any holes in the story, the comedy was lighthearted and real, and the drama was appropriately placed. Even though 4K UHD is a new technology that has been around for less than a year, Warner Bros. Home Entertainment has the format down pat. The video, presented in 2160p, looks better than it did on the big screen. The color palette is vibrant and the blacks are true. The picture makes it appear as if the actors are actually in the room with you. Complimenting this great video presentation is a great DTS-HD Master Audio 5.1 soundtrack. While this goes against the grain of most 4k releases that usually have a Dolby Atmos soundtrack, the 5.1 audio still does the job and provides great ear candy. The special features of the Combo pack are a mixed bag. General Phillips: Boots on the Ground and War Dogs: Access Granted have some overlapping material. It would probably have been best if they were combined into one featurette. It was interesting to see how much the real David Packouz contributed to the production of the film. The final feature entitled Pentagon Pie is a cute sing-a-long cartoon video that satirizes the rules and regulations that the government put into place that allowed these kids to do what they did. Often, real-life stories don't make a good transition to the big screen for many reasons- stilted dialogue, over acting, or the story doesn't flow. In War Dogs, none of those reasons happen. The story flows, the actors, for this genre, are absolutely remarkable, and when the movie ends one wonders why it was so short. 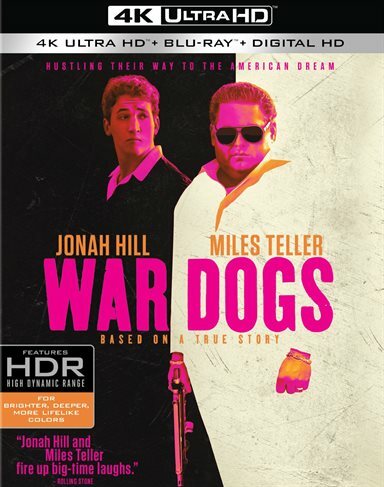 Download War Dogs from the iTunes Store in Digial HD. For more information about War Dogs visit the FlickDirect Movie Database.